Trump Sides With Russia On Election Interference - Joe.My.God. 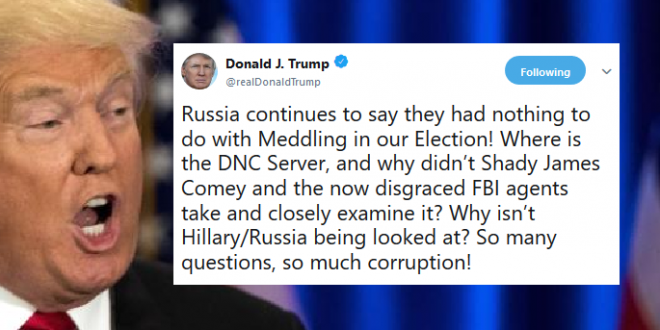 President Trump cited Russia’s denial of meddling in the 2016 U.S. presidential election in a tweet early Thursday, asking why former FBI Director James Comey did not examine the Democratic National Committee’s (DNC) hacked email server. The DNC in April sued the Russian government, the Trump campaign and WikiLeaks, alleging that they conspired to aid Trump in the 2016 election. The DNC said that by alleging that by hacking and publishing the committee’s emails, multiple individuals and groups were part of a larger conspiracy to damage Hillary Clinton’s campaign and help Trump win.